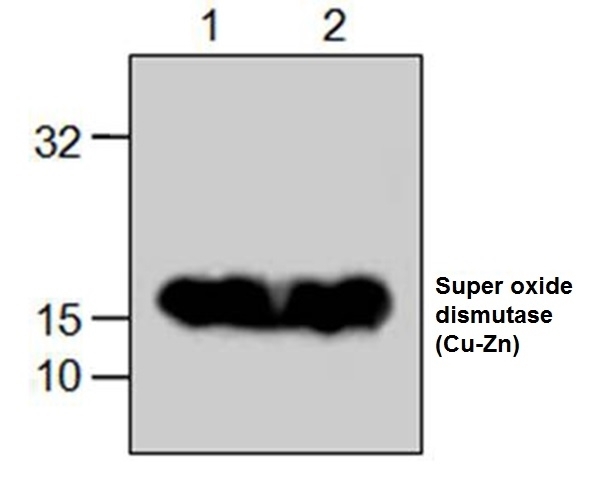 Western blot analysis of Jurkat cell lysate (lane 1 & 2) probed with Rabbit anti superoxide dismutase (Cu-Zn) antibody (AHP2347). Rabbit anti superoxide dismutase (Cu-Zn) antibody recognizes superoxide dismutase (Cu-Zn) also known as superoxide dismutase 1 (SOD1). SOD1 is one of three human superoxide dismutases. SOD1 binds copper and zinc ions and is one of three superoxide dismutases responsible for destroying free superoxide radicals in the body. It has been linked to familial amyotrophic lateral sclerosis.